This review is for the New Waterproof Hifi MercuryBox. 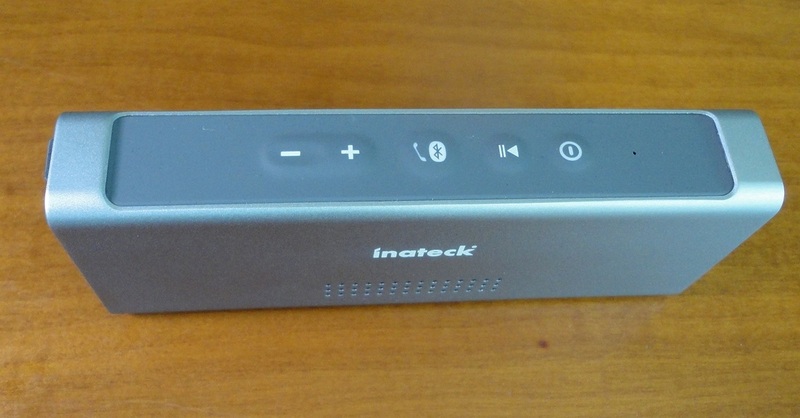 This latest Bluetooth speaker by Inateck, sent to me for test and review, has once again exceeded my expectations. The clean look of the all aluminium skin speaks of quality and up-to-the-minute aesthetics and the packaging is quite elegant, so that you could give this as a present with every expectation of impressing the lucky recipient. The speaker is small and light enough to slip in a pocket, and has an IPX5 waterproof rating, which means that it is not damaged by water jets from any direction. Hopefully, mild rain and water splashes would similarly not affect it, but it certainly shouldn't be dropped in the swimming pool! The accessories included are much better than average: a nice PU leather protective bag, good quality braided USB charging cable, braided 3.5 mm auxiliary cable to enable connections with non-Bluetooth devices, a braided lanyard to slip over your wrist, and a very clear manual (as always with Inateck). The acoustics are impeccable. Trebles are crystal clear but, unlike so many recent speakers, the bass is not muffled and boomy but warm in tone, with good resonance. The sound can be pushed to quite a loud volume without losing its character and integrity, thanks to the two powerful 5W speakers. This is now one of the two favourite speakers that my husband uses to evaluate his musical demos (the other one being the ADX Clarity). The battery life is very good (rated at 15 hours) while the range of 33 feet or 10 metres (through clear space) is fairly average. Connectivity with my laptop running Windows 8.1 was instant and consistent. Kindle, ditto. The pricing is very competitive, in fact, considering the sound quality, performance and excellent manufacture, I would consider this a really good choice. I would happily recommend this speaker to a friend. 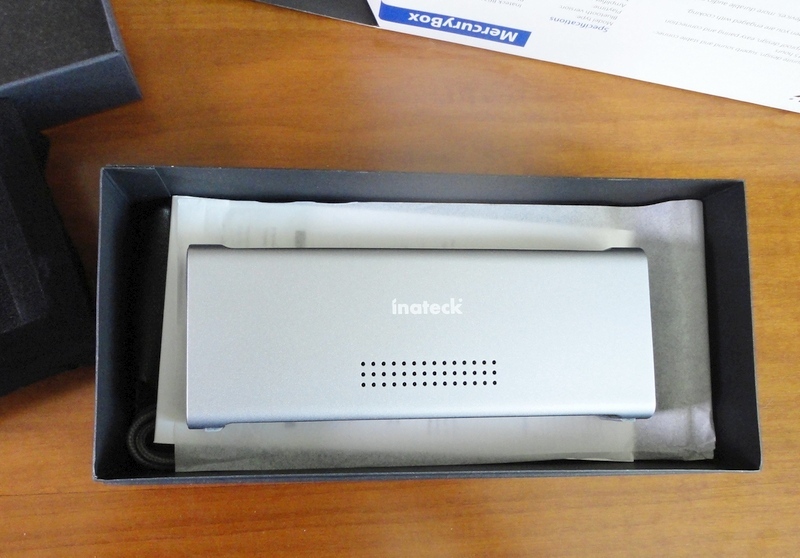 Another top quality product from Inateck. This speaker surpassed my expectations and I find it really attractive to look at (maybe because it reminds me of a honeycomb). Sound quality is exceptional, warm tones, good bass, very decent range even across solid stone walls. Connectivity with laptop running Windows 8.1 is trouble-free. In my opinion, this is a quality speaker, maybe a little pricey but worth it because of the solid quality and fine performance. My video has more detail so you can make up your own mind. I have had a chance to evaluate several portable Bluetooth speakers recently and one has to applaud the creativity shown in the design department. This combination wireless speaker and tablet holder is at the top of the class for sound reproduction, sheer good looks and the added usefulness of accommodating a range of tablets. It isn't the loudest speaker I have seen, probably because it is clearly designed to offer a mini-theatre experience when watching musical videos or movies. The body is aluminium, so it is relatively light but designed to be stable. The metallic finish is very attractive and does not readily show fingerprints. The model I received for evaluation is described as “coffee” but looks to me more like gunpowder grey. It is a very elegant, sombre shade that would fit in anywhere. 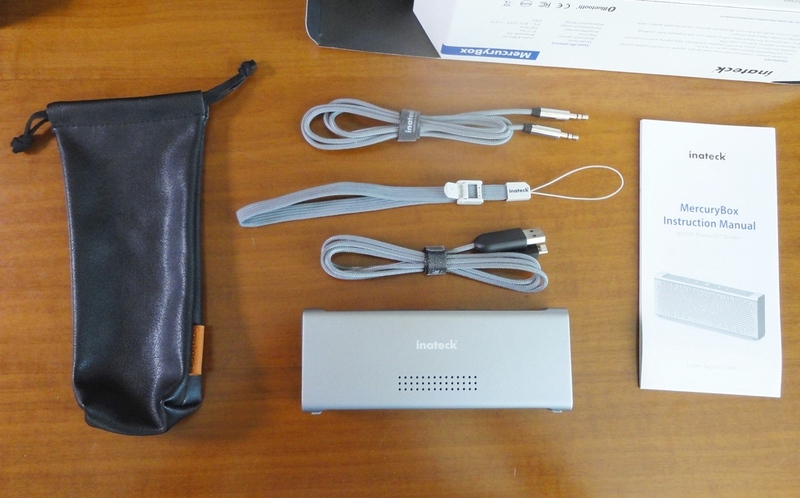 Included are a USB cable for battery recharging and a 3.5 mm cable for connection to non-Bluetooth devices. The minimal commands are contained in a small plastic panel at the back. There is an ON/OFF sliding switch, the USB port and an auxiliary 3.5 mm jack. Volume and other operating functions are controlled from the device it is connected to. The two 3 Watt individual speakers are located at either end of the tube, and combine to produce a lovely, warm sound that is loud enough for the average room, distortion-free and well balanced between bass and treble. I found that placement is important. Changing the unit orientation within a room allows you to select the best reproduction and, naturally, the surface it sits on plays a part. Connectivity was easy and immediate. I tested it with a laptop running Windows 8.1, my Kindle Fire HD and a friend's iPad. You access your device's Bluetooth settings, turn on the LaguLake speaker and a couple of glugs later, the it is recognized as HD-13001. It is compatible with a large range of devices, probably more than the ones identified, actually. And the 3.5 mm jack means that it will work with basically anything with that capability. Operating range was better than average, even across stone walls and the advertised battery life of 8 hours is very accurate. I could only find two shortcomings, both minor: (1) the speaker does not work while the battery is being recharged; and (2) the groove holds your tablet in a fixed position, so that the viewing angle cannot be adjusted. This speaker surpassed my expectations and I cannot overemphasize how attractive it looks. It is packaged in a beautiful blue velveteen jewel case and would make an impressive gift. At this mid-range price level, it represents very good value because the quality is certainly high-end. Another excellent product from TaoTronics. Don't let the playful, toy-like appearance deceive you. This speaker packs a lot of sonic muscle. It's loud and sharp as a bell. The sound is clear and pure but better at the treble end of things, bass tones being less well represented. Having said that, a lot depends on the device producing the music. I tested it paired with my Kindle Fire HD and got fairly good reproduction playing a music video, but when I switched to my pc, the sound suddenly became rounder and more balanced. It's not the most impeccable quality, but it will entertain a roomful of people in a dynamic and fun way. 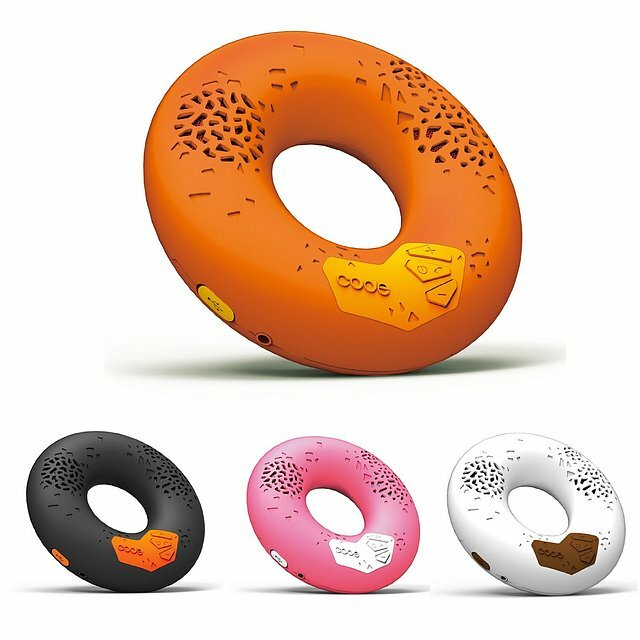 In the box you get the donut speaker itself, a USB micro cable to recharge the battery (initial charge took an hour with a fast wall charger, although the book says two hours), a very clear manual in six languages, and an NFC tag for easy pairing with enabled devices. 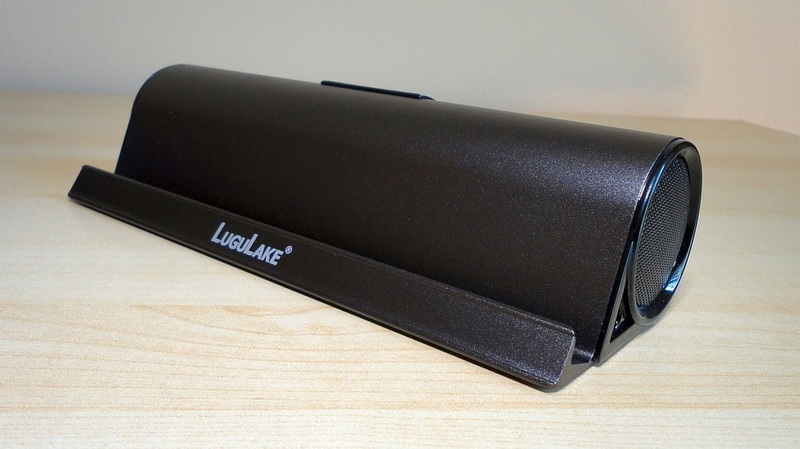 On the speaker, basic commands include an ON/OFF button, volume up and volume down. There is an integrated microphone for phone use and an auxiliary 3.5 mm port, next to the USB entry point, which is sealed by a rubber flap. I tested this with a cable I had, and it works perfectly. You could also use the same port for a headset. The stated battery life is 8 hours, which sounds just about right in my estimation. The clear range is pretty decent, 10 metres or 30 feet sounds accurate although, as always, walls and obstructions will diminish this. Bluetooth connectivity with a laptop running Windows 8.1 and with my Kindle is trouble-free. When I was offered this speaker to test, I wasn't sure what to expect, because it looks so much like a toy, but now I really like it. Because of the rubbery skin, it can probably take a few knocks but, despite looking like a life-saver, it's not water-proof and should be treated with some care. It comes in four edgy colours, clearly aimed at the younger market. It's a powerful little speaker with a fun, light-hearted look masking some serious technology. An interesting new entry in the field of Bluetooth speakers. 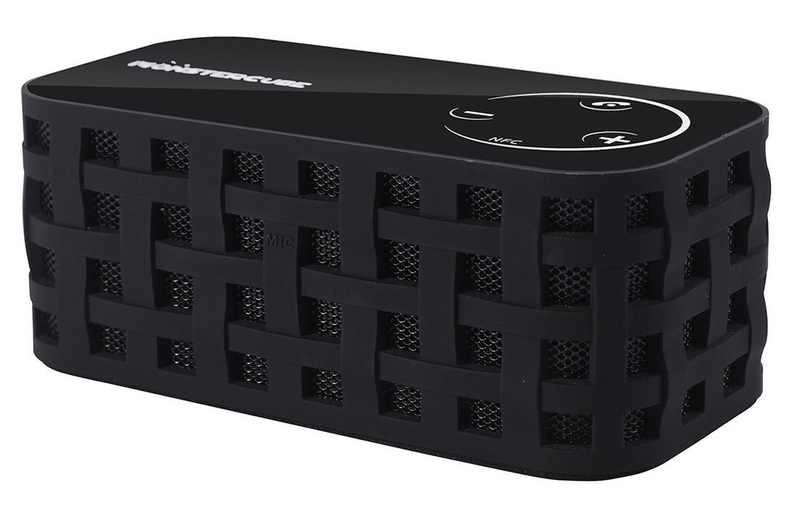 Clear advantages to this attractive speaker are the NFC compatibility, versatility (it works both in Bluetooth and wired mode), long battery autonomy (10 hours or more, according to the specs) and the classic good looks of a black exterior with basket-weave pattern on the sides; the top is shiny plastic, which is nice but tends to show fingerprints and dust. This speaker is also well positioned in the market, price-wise, especially if you are going to use it in connection with a phone as it also has an integral microphone. the whole well-packaged in a transparent plastic box with striking red accents. There is an ON-OFF sliding switch at the back, next to the inputs for USB and 3.5mm aux audio, and even a micro SD slot (unusual in my experience). On the top, basic operation is controlled by four touch-sensitive buttons: volume +, volume -, phone mode (also referred to as “Call”) and NFC mode. Charging the battery took much less than the stated 6-8 hours, but then I used a fast wall charger, so that may depend on your charging options (or perhaps the battery was already partly charged). Bluetooth connectivity was fast and easy and I appreciate the identifying signature “Monstercube”, instead of some obscure and difficult-to-remember model number. Less pleasing is the disembodied voice making various announcements, such as “Charging”, “Waiting for connection”, and something else I can't quite catch. The Monstercube delivers surprisingly loud, clear sound, especially good in the treble range. The bass is thin and would not make an audiophile swoon but then, the sharpness is much more appreciated when used with a telephone, where too much bass would make speech less clear. I was not able to test the NFC functionality as I don't own a compatible phone, but it's a good, forward-thinking feature. Range was pretty decent; the sound travelled well in clear space up to 30 feet and even crossed a thick stone wall inside the house, but started to break up through the second wall – not surprising and consistent with other speakers I have tested. I found the volume + and – controls a bit hit-and-miss. One press is supposed to make the volume go up or down and a double-touch skips to the next or preceding track. In my testing, the sensitivity of the top buttons was not very reliable. I didn't notice the volume changing, so I kept hitting the key, causing the tracks to skip. Slightly annoying. Perhaps greater familiarity with the commands will improve my user experience. The sound quality is a bit too sharp for my kind of music. The audio cable looks solid and supple but the connectors are a bit unsteady and caused occasional crackling when connected to my desktop computer. In my opinion, at the current price of about £26 (UK) or $20 (US), this is a very competitively-priced, solid speaker, offering up-to-the-minute features and clear, loud sound reproduction, especially in Bluetooth mode.